Determining the condition of bridges and making decisions regarding rehabilitation or replacement is referred to as Asset Management. DOTs across the U.S. dedicate significant resources to managing their bridge assets through a variety of preventative and preservation methods. 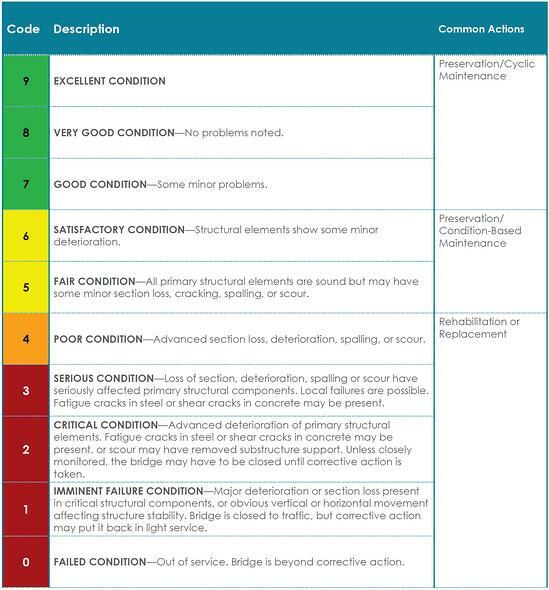 GCR Rating of 7 – 9: Bridge is in good to excellent condition, no significant structure issues that need to be corrected, no repairs required, routine maintenance performed. GCR Rating of 5 – 6: Bridge is in satisfactory to good condition, some structural problems may require maintenance or repair beyond routine maintenance. GCR Rating of 4: Bridge is in poor condition, section loss on the deck, supporting superstructure or substructure is evident, repairs made when necessary, bridge is scheduled for replacement of rehabilitation in the coming years. GCR Rating of 3 or less: Bridge is in serious condition or worse, significant deterioration of the bridge requiring immediate intervention, bridge traffic should be restricted or closed until repairs are completed. The traveling public is typically not aware of the condition of the bridges they drive over. Bridge condition rating takes an experienced engineer to inspect the bridge and determine the condition of its component parts.Routine Bridge inspections are regularly performed at intervals not exceeding 24 months. Inspection of the bridge yields a rating of each of the components and the development of the overall bridge rating, the condition rating scale includes “the materials used in the bridge, as well as the physical condition of the deck, superstructure, and substructure components.” The GCR system was developed by the Federal Highway Administration and is described in the FHWA Coding Guide. 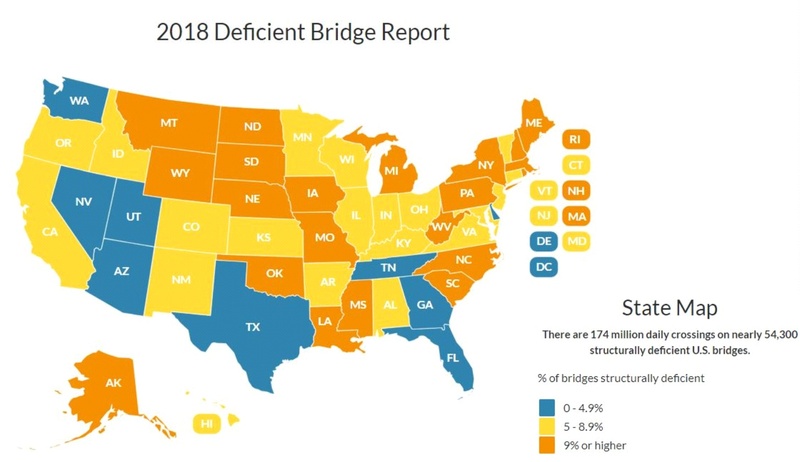 As of January 2018, 54,000 U.S. bridges were deemed to be in poor condition or worse and in serious need of rehabilitation. Though this number has decreased in the last two years the cost for rehabilitation has increased. DOT Engineers are keenly aware of the need for bridge rehabilitation and estimate the total cost of highway bridges needing rehabilitation in the U.S. at 17 Billion dollars. Many of today’s highway bridges were built in the 1950’s and 1960’s. These structures are now reaching or exceeding their proposed life span. State DOTs are facing a significant problem balancing the costs of operations and maintenance, new construction and the ever-growing needs for rehabilitation and repair of their aging infrastructure. Innovative approaches are needed to provide cost effective repair methods with a focus on the longevity of those repair solutions. In order for the United States to once again be the leader in bridge infrastructure and innovation, past techniques that worked (or didn’t work) and the current methods being used must be reevaluated. New techniques and recent advancements in concrete materials hold great promise for establishing the right path. Modern bridges make use of concrete, steel or a combination of both. “Incorporation of fibers which comes in the category of high strength gaining materials is now incorporated for the construction of bridges. These materials are also used in order to strengthen the existing bridges.” According to the American Society of Civil Engineers, new “materials such as Ultra-High Performance Concrete” are adding longer life to bridges as the need for bridge innovation in the US is pressing. “Most of the modern bridge construction makes use of concrete as the primary material. The concrete is good in compression and weak in tensile strength. The reinforced concrete structures are the remedy put forward for this problem. Traditional concrete lacks longevity and strength, along with the factors listed above. Those factors are why fibers are being used to strengthen concrete for new bridges as well as maintain and rehabilitate existing bridges made with less-than-standard concrete. In the US, the mindset up until recently can be summed up in one phrase – “Worst First.” Find the bridge that needs the most repair and start there. This method acts as a Band-Aid, solving an immediate problem - one bridge close to falling down - but doesn’t present a long-lasting solution. The US infrastructure is currently overloaded with bridges in the rehabilitation category. With our ever-growing population and more commuters, it’s imperative for the States to adopt a proactive mindset to keep bridges from entering this category. This means prioritizing a bridge that only needs minimal maintenance and is considered in good or fair condition. The US is on the right track thanks to the forward thought and action of Bridge Rehabilitation Engineers. 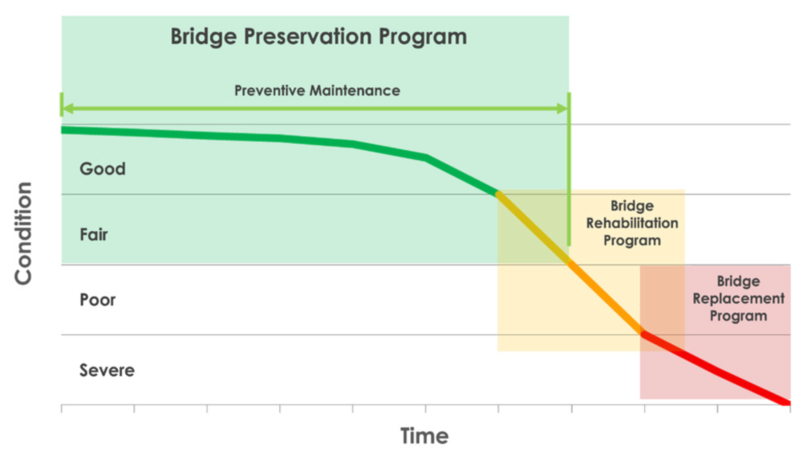 The Preservation Guide announced, "The HBP (Highway Bridge Program) afforded State DOTs discretion to use funds not only for bridge rehabilitation and replacement but also for a broad array of preventive maintenance activities.” This is a huge step that will be noticed in the US infrastructure world in years to come. 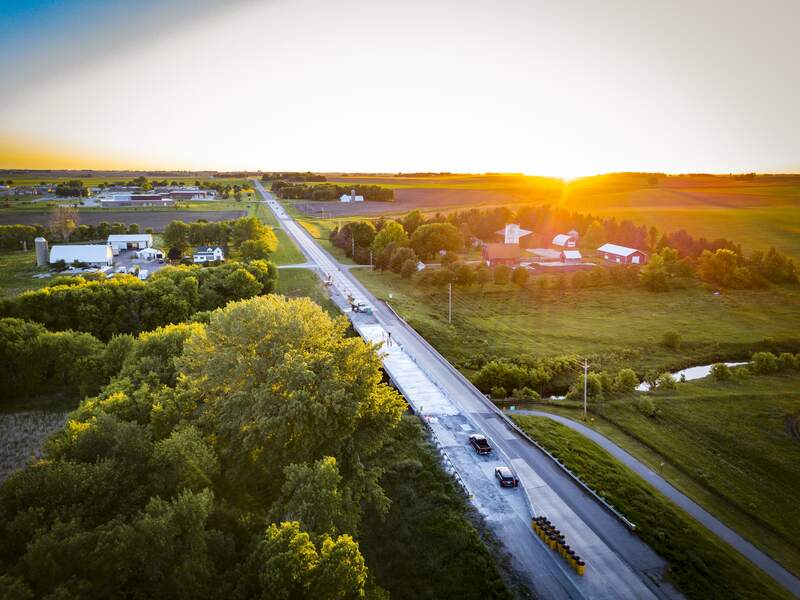 The FHWA has seen the concerning infrastructure grade connect with the ‘worst first’ mentality and is currently striving to be more strategic and future-minded by implementing a bridge program seeking a balanced approach in preservation and rehabilitation. In the 2017 budget overview from the FHWA, they stated, "The need to invest in our transportation infrastructure becomes even more apparent when one considers not just the state of our infrastructure today, but where we are heading in the future." This change will ultimately slow and, with innovative options, potentially nullify the need for rehabilitation or rebuilding altogether. When a bridge is in the phase of rehabilitation, as opposed to maintenance or repair, the cost is far greater because of the complexity of work, resources, and time needed. In a press release from USA Today, "Cities and states would like to replace the aging and vulnerable bridges, but few have the money; nationally, it is a multibillion-dollar problem.” “Selected states reported little change in the way they fund and manage highway bridges” to the Government Accountability Office (GOA) in a survey in 2016. They acknowledged it's not that states are unaware; some have made proposals to pass a plan for funding infrastructure needs, but they oftentimes stall due to fights over details which ultimately prolongs the national infrastructure problem regarding bridges. Bridge Rehabilitation Engineers are restricted by state and federal budgets, leaving them using temporary repairs and patch fix jobs to stay ahead of deterioration. Those who are hands-on in bringing up the infrastructure grade (DOT and Design Engineers) are greatly affected by the extremely tight budget they’re working with. Pressing needs of rehabilitation without the funds to fix the problems, and the responsibility resting on their shoulders prolongs the problem. There are two phases that take time for bridge rehabilitation. The first phase is completing a National Bridge Inspection Standards (NBIS) inspection and updating/inputting SI&A data into the state or federal agency inventory. This takes place within a 90/180 day period. The second phase – the construction - is when the public is affected by and experiencing the daily grind of a bridge going through rehabilitation. The construction phase generally takes 24 months, assuming no greater repairs are needed outside of rehabilitation. Extra repairs needed would also warrant more inspection phases to be executed and documented, extending the construction period. Starting in the 1950’s, bridges were built with an expected lifespan of 50 years. Most of us are too busy or trusting to think about a lack of safety when it comes to what we’re driving over. Thankfully, DOT’s and Design Engineers have safety as their first priority when it comes to bridge rehabilitation. As those inspecting bridges, they’re aware that “all that is required to cause a fracture critical bridge to collapse is a single unanticipated event that damages a critical portion of the structure.” Though safety is of the utmost concern, surprising collapses still happen. This is another area compelling DOT Engineers to look for better solutions; solutions that are innovative, safe, fast and ultimately, solve the current problems we’re all facing within transportation in America. Some solutions they’re looking into are advanced concrete that will greatly contribute to minimizing rehabilitation needs. The US infrastructure grade is on the rise due to methods being adopted like in the FHWA Preservation Guide of 2018. Even with new methods, the materials that have been used for the last 70 years keep the US in the game of Band-Aids, slings, and temporary fixes when it comes to our bridges. We need to be in a game of permanent solutions that check a bridge off the list because there’s no need for maintenance. Bridge Rehabilitation Engineers are looking into the new option of advanced concrete, Ultra-High Performance Concrete to be specific, because they see how it solves the current, pressing problems and brings solutions to their job in enabling America’s Transportation. “Ultra-High Performance Concrete, or UHPC, is a ground-breaking (no pun intended) metallic reinforced cementitious-based material with extraordinary properties. UHPC can be used in a variety of bridge solutions to include joint fills, overlays, pier jacketing and a variety of other innovative applications.” UHPC Solutions® is eager to develop and expand the use and adaption of ultra-high performing concrete in the infrastructure rehabilitation market in North America. The chemical reactivity and extremely fine grain size, measuring at a maximum of 600 micrometers, are what provide the enhanced durability. Early introduction and testing of UHPC began in 1994, over 20 years ago. The first use of UHPC for a North American bridge was in 1997, for construction of the Sherbrooke Pedestrian Bridge in Quebec, Canada. Although not a highway bridge, it has been exposed to light vehicle loadings for winter snow removal and severe freeze/thaw conditions as well as deicing salts for almost 20 years proving UHPC’s durability in an climate. What do all these added materials and ”compressive strengths’ do for bridge engineers and the current infrastructure of America? By providing strength, durability, ductility, and workability, UHPC accelerates, improves and advances the current infrastructure grade. Bridge Engineers are equipped to be problem solvers through UHPC, not problem prolongers. UHPC Solutions® can be utilized through their trusted and proven partnership with WALO and Posillico. Both companies have led the way in implementing UHPC as a solution. WALO has been serving the construction world for over 170 years and has executed their values every moment. Posillico, one of the top engineering contracting firms in New York, strives for excellence, and UHPC Solutions® allows them to continue doing that for the East coast.